This is my first time on here and I'm excited to be getting an NC 895 this summer. I'm being told things are a bit behind at the factory and we may not get a boat until the end of the summer. What i wanted to hear from the group is how people are dealing with a dinghy and also is anyone skiing/wake boarding with an 895? We opted to go with a single 300 to keep her a little lighter but that leaves us with no way the easily to locate a ski rope eyelet anywhere back there. And another question; If the MI factory isn't installing the overhead cabinets, has anyone had any luck getting them from the dealer, either from Jeanneau or custom? I am told my 895 will ship July 30, hull number 43. Anyone have info on what hull number is shipping now? Our 895, hull 33, arrived in Blaine Wa Sun July 1st. Only 2 1/2 months late, but who's counting :') I arrived Monday morning as the guys were completing unwrapping. One of the guys said, "nice boat, but no steering wheel". I thought he was kidding. Turns out Cadillac did not include the steering wheel or mount, the throttle or mount, the engine hydraulic mechanism or the engine gage. They didn't include a prop either, but fortunately Sundance had one waiting per my specs. I haven't received word yet on why they would ship a boat without this stuff. The missing parts were quickly ordered. Hopefully we get word on their status tomorrow. I did a complete visual inspection as soon as she was unwrapped. Overall, other than some other minor missing stuff, I'm very pleased with the build quality. There are some build things I noted in the inspection like a screw not fully installed and a cushion out of shape, but most of my findings are minor and easily addressed. There was no damage to anything so that's great. I noted some improvements in the woodwork and a new AC electric control panel. Perhaps these are part of the 2019 model changes. So even though the delivery is late I'm pleased that this is a 2019 model hull. And there was another surprise. The Yamaha 300 is white! This is an available expensive option that I recently learned about. I considered it but figured it was too late in the order process and who wants to pay extra? Color is of course a personal choice. I've seen a test with an 895 and a white engine in Australia, and it looked beautiful in the pictures. So I'm pleased with this surprise. As discussed earlier, as expected it came without the overhead cabinets in the main berth. Sundance is looking into their availability for a local installation. However I may decide to not get them. There are pros and cons to having them. The boat I call The Phantom boat is still in Cadillac waiting for delivery to Sundance. This is the boat Jeanneau built in error without a customer that should have been my boat. It was completed before mine but they held it and shipped mine instead as they knew I was anxiously waiting. Sundance tells me there are many boats industry wide in the US waiting for delivery due to a shortage in trucks and drivers. I'll repeat my email for a few of you that communicated separately with me: lynnardm@hotmail.com If you still want to see the boat or want to exchange details let me know. I plan to be in Blaine Monday the 9th. Here is a quick update on my 895 delivery. The boat has been in Blaine Wa 2 weeks. The team there is doing a great job on installing my electronics etc. and standard commissioning items like batteries are being done. I learned that jeanneau goofed this boat up worse than we first thought. In addition to steering components and throttle components missing they configured it for twin engines instead of a single. So changes like reconfiguring fuel delivery need to be accomplished. Some of the parts jeanneau says they don’t have so Skip (in Blaine) is working to find them elsewhere. I have no idea when the boat will be complete. Very frustrating but at least the Sundance guys are doing their best to make everything right on the boat. For those fiollowing my 895 delivery. It’s now a bit over 3 weeks since it arrived. Inspection pickup. It’s hard to keep a smile on my face but am appreciate skips commitment to make it right. I know Lynn, it’s painful! This is all on a Jeanneau. As much as I love my boat, I can’t believe they continue to mess up on orders like this. There really is no excuse except poor management and lack of customer service and satisfaction. Come on Jeanneau, we expect better from a quality boat maker! I cancelled my order because of these delivery issues. Was to be delivered in May. May slipped to June. After looking at issues I guessed June would become July and July would become August, etc. Puget Sound season is over Mid-September. It looks like I was right. I told them to cancelled order in late April. Lynn-I think you are getting my hull. Sundance should feel lucky I cancelled. Don't know what they would have done with your "ghost hull". if that is really a thing. Now I'm on the verge of filing a lawsuit against Sundance for refund. Sorry to hear you decided to cancel your order. I certainly understand your frustration. Given your boat was initially scheduled for May, about a month after our boat, I would have thought it would have arrived by now as ours arrived July 1st. Did you get a recent update on the status, and reasons for delay? Status on our boat is that its still at the Sundance facility in Blaine. 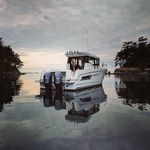 They are waiting for the correct engine control wiring harness, fuel tank controls, and engine mount info from Jeanneau. Again, ours is a single F300 engine which is being installed locally. Most orders are twin 200's which are installed at the factory in Cadillac so they shouldn't have this problem of missing stuff. This is today’s update from skip at Sundance. He now has all the parts for the fuel tank controls. The parts they use in Europe are not USCG certified in the US so he can’t use them. He is going to put a manifold control in the cockpit (accessible in the storage area) that provides either both, left, or right tank. Unless rebalancing of the fuel levels is required I should be able to leave it set on both. He also has all the parts for the throttle and steering. But is still waiting for engine mount info from jeanneau. His lead tech (who I haven’t met) was gone but now back and working on the boat. If jeanneau comes through with the engine mount info today they should be done in a few days. Delivery possible end of next week. Delivery update for "Knee Deep". Hull number 43 shipped from Cadillac today, Aug 6, with expected delivery Thursday. There have been delays but compared to other dealer promise of October, way ahead. I ordered without Generator, AC, or Electronics as I prefer to do those items myself and enjoy the project and intimate knowledge of their workings. Can't wait to get her and we will be doing lots of traveling on her. For those of us still waiting for our 895s, what was your original estimated delivery date and what is your current status? For example, we put down the build deposit in March for an estimated delivery date of July 2. Last we heard, our new date is August 17. ( We're not optimistic about this date either). We ordered from Sundance in Blaine. Placed deposit at the Seattle boat show for a July delivery (no specific date in July) the boat is expected to be in town at the beginning of Sept with delivery mid Sept. The broker has been very responsive and accommodating and heard from the Jeanneau America folks explaining the production delays. I'm almost motivated to change my order to a 1095 for spring to be on the water in the summer. -Anyone water ski with the 895? -Anyone have a weight on their 895 from a scale? Hello. I thought I would give a quick update on our NC 895. We have owned the boat a little over a year. Our boat is located in Puget Sound. We use the boat primarily to cruise, boat camp, whale/wildlife watch, with limited fishing (including crabbing). 1) The layout of the boat. It can sleep five comfortably, and we have had up to six. When traveling up to five can be seated in the pilot house facing forward. 2) Price – we were looking at used boats but this boat new fell within our price range. 3) The twin 200 outboards. Along with the bow thruster, makes maneuvering the boat so much easier. 4) The 160 gallons of fuel provide sufficient range for most trips we take in Puget Sound. 1) The boat is not a “wave killer.” In rough waters you do have to slow down. The bow is blunt, provides more interior room, but probably contributes to pounding. 2) The back bench is not ideal. The bench has to be in the forward position to raise the motors, but the bench should be in the back position to use. 3) The bench on the bow is of questionable value. The angle and height of the back of the bench does not provide adequate support. We have never used. Recommendation: We had the Garmin 7612 combo screen gps/radar/sonar installed by the dealer as part of the original purchase price. The 12 inch screen is well worth it. Problems to date include the wiring harness for the heater failed (a known problem for sister hulls). Also, the latch for the port side sliding window fell apart. Factory screws were way too short. The dealer fixed both issues under warranty. We are enjoying the boat to date. Sorry to hear all the horror stories on deliveries. It was the same over a year ago. Of the single 300 is as good as if not better than the factory. We’ve stayed here several days to play a bit and visit friends. I took a detailed look into all the hidden areas of the boat before we head out today and everything looks great. Looking forward to a week of cruising in the San Juan’s. I’ll provide some data on boat performance after our return. our 895 offshore is now two months old. I agree with dogbreath on the like and dislike points, especially that it doesn't take rough water as well as I had hoped. Had a major problem the other day. We were anchored out for about two hours and when we tried to start the engines neither one would start. Sounded like a car would when the batteries' are almost dead, also found that the motors would try to but not raise up. No, we were not discharging the batteries when anchored, and yes, throttle levers were in neutral. When we pushed the start buttons several of the switches on the row of switches would light up, thought that was very strange. While trying everything I could think of received a alert on the Yamaha screen to check the starboard engine. After about 35 minutes It is now completely dark outside and the wife is looking for a tow boat service, suddenly everything starts working! Made it back to the slip with no other problems. The next morning I load tested the two batteries which passed with flying colors, looked all over for loose connections that I could find, and found no problems. I have tried to duplicate the event many times since then but could not, everything's working fine. So now we have a dark cloud hanging over the boat just wondering when it well happen again. Has anybody else out there experienced anything even close to this? Update on Knee Deep. We expect to do the Sea Trial Thursday, August 23rd. We placed the order on May 2, so just under 4 months from order to getting the keys. We ordered without electronics, AC, and Generator, so not sure if that sped up the process. Dealer and Jeaneau have been great and totally transparent on the struggles getting Cadillac up to speed. There were a couple of workmanship issues on a Cadillac boat I inspected early on, I let them know, and on mine it was corrected.